Though there are no laws regarding the mandatory use of child safety seats in India, using one goes a long way in ensuring the safety of your child. Children, with all their pent up energy, rarely sit still. As a result they are more prone to injuries in a moving vehicle. Even in a crash or while braking hard, children are more susceptible to harm. There is a misconception that holding a child in one's arms is enough protection. But that is not so. In a situation that requires you to react fast, you might not be able to protect your child. The only effective way of preventing a child from being thrown forward or out of his seat is to have the child secured. 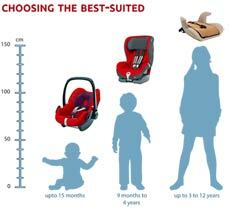 And no, this doesnt mean you belt the child down using the car's seatbelt as these are designed for adults. This is just as dangerous as having the child in your arms. What you need to do is invest in a child safety seat. But, also remember it's important to choose the right seat. The wrong size and the purpose will be not be served and you would have wasted money on a seat that could even potentially injure your child. As the classification implies, these are meant for infants-till they are about a year old or weigh over 10kg or are over 50cm tall. Infant seats are designed to face the rear of the car as this is the position in which they can best protect a child whose neck muscles are still developing. 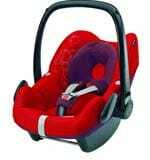 An additional benefit of an infant seat is that, more often than not, they are designed like a basket with a handle so that the infant may be carried around even without taking him out of the seat. There are some brands that will also allow the seat to be a detachable part of a stroller set for added convenience. Only when they are over a year old can children safely progress to the forward facing toddler seat. These seats are designed to prevent the child from being thrown forward, courtesy a strong three-point harness that usually features adjustable belts to secure the child. Apart from this, heavy padding and soft braces around the neck prevent whiplash injuries or the material of the seat causing the child harm. These seats can usually be adjusted to allow the child to sleep in a comfortable position. Booster seats are used for children who have outgrown their toddler seats but havent reached adult height. A booster seat essentially raises the childs height so that the cross belt of the car's seatbelt does not pass over his neck-an extremely dangerous thing to happen. Generally, booster seats can be used for children till they reach the average adult height. It isn't just enough to buy a child safety seat but also important to know how to make use of it. The first and most important rule is that the child seat itself has to be buckled down securely using the car's seatbelt system. Without this in place, the seat itself is mobile and will be thrown forward in a crash or under harsh and sudden braking action. Secondly, once the child is placed in the seat, he must be strapped in. Otherwise, the whole exercise is self-defeating. Always try and put the child safety seat at the rear of the car though it might put a constraint on the space available. Never put it in the front seat without disabling the passenger side airbag if your car has one. Of course, infant seats should never be put in the front seat of the vehicle. Last but not least, do not scrimp on the seat when you buy one. Pick out the one that suits you and purchase the best that you can afford. It'll always be a small price to pay for your child's safety. Seat the child with the back tightly against the backrest. The lap belt should run just above the pelvic bone and not on the stomach. Remove any sharp objects from your child's pockets. Make sure the harness is adjusted properly. It should be tight leaving the space needed for two fingers to fit between the child's chest and harness. Ensure that the padding of the straps are over the child's shoulders. In a booster seat, the diagonal strap should rest on the child's shoulder, not the neck. Never tuck the seatbelt under the child's arm or behind their back. This is dangerous. The rear seat is the safest for children of all ages. Infant seats for children under the age of one should be reclined at a 45 degree angle. Make it a point to check the restraints from time-to-time and change it if you find signs of wear and tear. Do not use an ordinary cushion. Instead, use the special booster cushion as the seatbelt will not be tight otherwise. Do make sure that your child understands the importance of being safely strapped in for every journey.